Our classes consist of a wide range of activities which include singing, dancing, expressive movement, beat keeping, the playing of both pitched and non-pitched percussion instruments, and more. 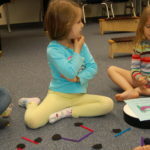 Activities are performed with an eye to developing each child’s understanding of pitch and rhythm through the use of rhythm syllables and solfege. This approach gives students a comprehensive understanding of the fundamentals of music and the ability to create music themselves. Children are encouraged to contribute their own ideas to the class from an early age, thereby giving them ownership of the creative and musical process. This JOJY method approach not only strengthens each student’s musical ability, but also their general cognitive skills. Registration for the Winter Term is now open! Orff Kodaly for Babies is a class specifically designed to nurture the social, emotional, cognitive, language, physical, and musical development of your child. 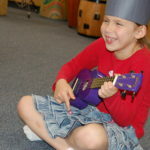 Classes include chanting, singing, vocal play, finger play, exploration of musical instruments, movement, and more. In this fun, interactive class children and their caregivers will explore music in a variety of ways, nurturing development and a love of music. A parent or caregiver must attend with child and be prepared to participate in class activities. *Child must be no older than 19 months of age by Dec. 31, 2018. Orff Kodaly for Toddlers is a fun and exciting class which explores music through musical movement, singing, expressive movement, song games, imaginary play and musical instrument play. Activities are structured around a variety of traditional and contemporary songs from various places around the world. Through song, instrumental play, and creative movement we explore the concepts of pitch, rhythm, timbre, tempo, beat, and improvisation. Class includes playing a wide range of non-pitched percussion instruments and the introduction of pitched percussion instruments (xylophones). 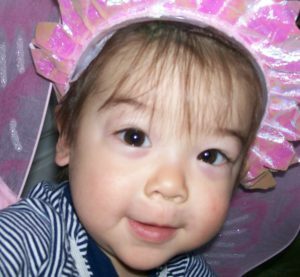 This class is designed for toddlers accompanied by a caregiver prepared to participate in class activities. Newborn siblings are welcome but please make alternate arrangements for older siblings. **Children must be 20 months old by Dec 31, 2018. In our Orff Kodaly for Preschoolers class, your child will build upon their musical knowledge through singing, chanting, movement, playing pitched and non-pitched percussion instruments, imaginative play, and more. Based upon the philosophies of Carl Orff and Zoltan Kodaly, these classes are designed to nurture your child’s love of making music. 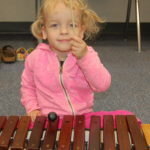 They will learn about rhythm, pitch (solfege – do re mi’s), timbre, beat, and improvisation while helping them to develop their social, language, cognitive, emotional, and musical skills. 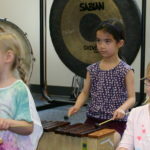 This unique program intensifies their musical learning experience through improvisation, musical games, singing, structured and non-structured instrument play, creative movement, storytelling, etc. Each week your child will bring home a hand out with a new song and relevant musical concepts. Parents/caregivers are welcome to join us for the last 10 minutes of each class. Children must be 3 years old by Dec 31, 2018. Orff Kodaly for Advanced Preschoolers is a fun, interactive class where your child will build upon their musical knowledge through singing, chanting, movement, playing pitched and non-pitched percussion instruments, imaginative play, and more. We will explore musical concepts such as rhythm, beat, pitch (solfege – do re mi’s), timbre, improvisation, dynamics, tempo, etc. Based upon the philosophies of Carl Orff and Zoltan Kodaly, your child’s musical experience will be intensified through improvisation, musical games, structured & non-structured instrument play & creative movement, accompanied & non-accompanied singing, allowing them to discover elements of music in a variety of ways. Parents/caregivers are welcome to join us the last 10 minutes of each class. Children must be 4 years old by Dec 31, 2018. Orff Kodaly for Kindergarteners is a fun & dynamic class where your child will learn and build upon their previous knowledge of a variety of musical concepts such as pitch, rhythm, tempo, dynamics, and beat. These concepts are explored through singing, games, stories, creative dramatization & movement, and playing pitched & non-pitched percussion instruments. Your child will have the opportunity to learn a variety of traditional and contemporary songs from around the world and perform partner & circle dances. In the Kindergarten level, children learn to play more complex accompaniments on non-pitched percussion instruments and xylophones. 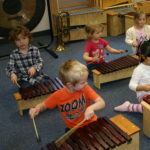 They will also learn to play simple melodies and improvise on xylophones as well. Parents are welcome to join the last 10 minutes of each class. Children must be 5 years old by Dec 31, 2018. Our Orff Kodaly for Grade One classes explore the fundamentals of music through singing, dancing, expressive movement, song games, imaginary play, creative dramatization, and musical instrument play. Activities are structured around a variety of traditional and contemporary songs from around the world. Children continue to develop their understanding of music fundamentals through the use of solfege (do, re, mi…), rhythm syllables, and through the exploration of musical concepts such as pitch, rhythm, timbre, tempo, dynamics, rhythm, melody, form, and beat. Class includes playing both pitched and non-pitched percussion instruments. 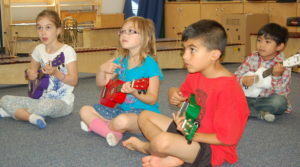 In addition to percussion, children will learn to play ukulele and read basic tablature. Parents are invited to attend the last 10 minutes of class to participate in/observe class activities. Children must be 6 years old by Dec 31, 2018. Our Group Ukulele an d Group Guitar classes teach your children the basics of technique including picking and strumming technique as well as reading music notation and tablature. Children will be engaged in strumming, picking and singing a wide repertoire of contemporary and classic music. No experience required. We will be working from a method book, the price of which is included in your fee. Students must supply their own ukulele or guitar (instruments must meet a minimum playability standard as assessed by the teacher- for a recommended list of instruments to purchase please contact jojymusic@gmail.com ). We apologize, but no Level 1 Group Guitar Class is being offered for the 2018 Fall Term.